Hello my darlings, I’m Fatima Sugapong the fashion columnist. 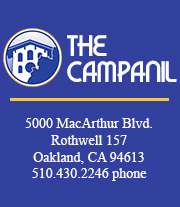 The Campanil‘s online editor Melodie Miu and I are bringing back our weekly fashion blog. We are keeping our eyes open for our favorite looks from the Mills community that’ll stand out in this warm yet breezy weather. The autumn breeze has been teasing us with hopes of a cooler tomorrow, so it’s about that time to whip out your favorite cardigans and ankle-cut booties. As we went around Adams Plaza yesterday, I was looking for warmer looks: something that catered to the fluctuating temperatures the Bay Area loves to tease us with. From the cold mornings to the warmer afternoons, a Millsie-on-the-go might not always have the time to change throughout the day. We found senior Alanna Le Ho in an all-vintage outfit, her white John and Yoko print tee tucked into her black high-waisted denim pants. Alanna’s sleek and simple fit is artistically balanced with her jewelry. 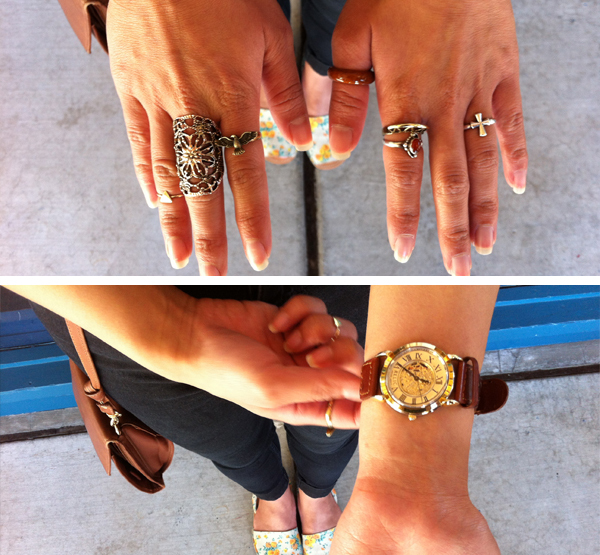 Notice the varying styles of her rings, including the knuckle ring on her right ring finger. Knuckle rings allow you to play with your obsession for jewelry. When it comes to accessories, it’s just so much more fun to wear a lot of them (and they’re the only things you can wear a few of at the same time). They add subtle details to your outfit. They’re tiny, chunky, simple and eclectic hints to who you are as a fashionista. This is only the beginning of what I’ll be giving you this year! So watch out for links to cool online stores, other fashion blogs, and of course, weekly features of your favorite Mills fashionistas! Look out for us at Adams Plaza every Monday during the lunch hour. And if you’re interested in contributing articles or ideas to my fashion blog, don’t be afraid to let me know! E-mail me at sugapong@thecampanil.com. So stay tuned, stay curious, and stay fabulous!